Grouponâ€™s Recommendation Service â€“ A good deal or a marketing trick? It is an international website which claims to offer the greatest deals on a broad range of all kinds of products and services. What is the recommnedation service? 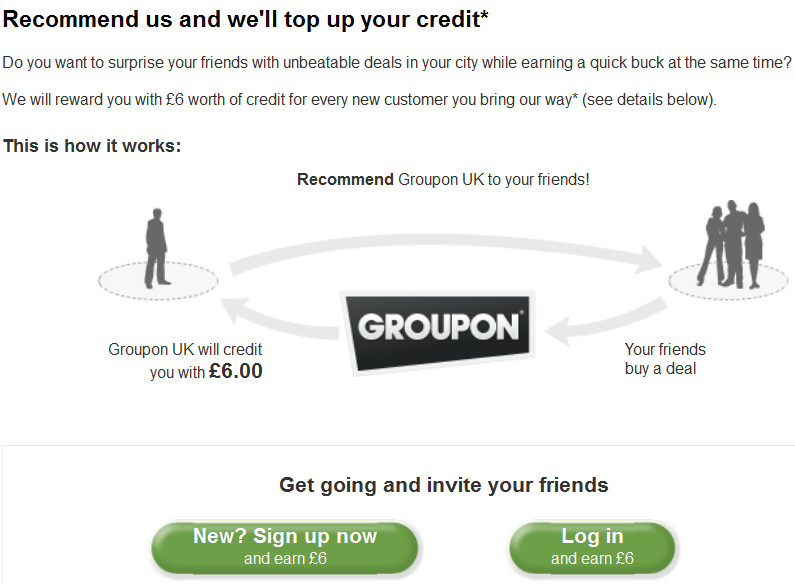 Groupon has been long advertising a Â£6 Groupon credit for referrals. What does this mean? If a person recommends this deal to one of his friends her account will be credited the value of Â£6 as a reward. This would count for every friend that a person sends to Groupon and buys any deal on their website. The credit could then be redeemed against a future deal of choice. Always read the fine print first! To refer a friend to Groupon, you need to have a unique referral link to pass along, but it’s very easy to get. At the top right of every deal page, there’s an orange tab which says “Recommend now and get Â£6 for every recommendation!”. BUT the most important bit lies in the fact that the recipient of the link will need to register a new account and make a purchase within 72 hours of clicking that link. Which in turn means you wonâ€™t get any credits for people that are already registered with Groupon or that delay their purchase beyond the time limit. Should you manage to refer someone new to Groupon successfully; the credits will automatically show in your account after a seven day delay period and are valid for 6 months. BUT (yes, I am afraid thereâ€™s another BUT…) the company advises that because these credits are automatically credited to your account, there is unfortunately no way for Groupon to track referrals that did not successfully go through. *Your friend did not purchase the deal in one go after clicking your link. *Multiple people referred your friend and your friend clicked a different link to subscribe or buy. *Your friend is not a first time customer or has previously opened an account with us. *Your friend has not purchased their first Groupon yet (even though they have subscribed). Basically it looks to me that the recommendation service is a great way for them to go viral by offering Â£6 credit for every recommendation, but they have also created the small print that says something different than the offer they are advertising but protects them eventually from having to pay out the credits to the consumers. Is it a scam? At the end of the day, I wouldnâ€™t say itâ€™s a scam. But at the same time, people do need to read the small print to understand what the recommendation service is about as the promotion of the service itself is misleading. So, my take is that it may not be a scam but it is still a not-totally honest marketing trick to get people to work for them for free. Entry was postedon Friday, October 26th, 2012 at 6:29 pm	under Best Deals Category.Leave a response, or trackback from your own site.